For Anatolia, contaminated water is a thing of the past. And she intends to keep it that way. This World Water Week, Pure Water shares with you a story similar to those we hear from our field teams throughout the year. For many of our partner community members, biosand filters have become a staple of daily life. 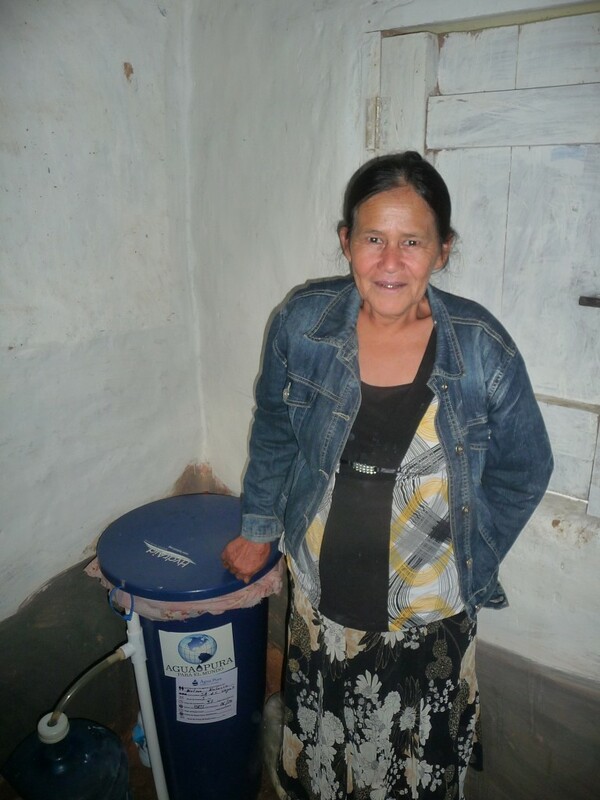 It’s been three years since Anatolia Nolaco, a 63 year-old Trojes resident, received a biosand filter through her community’s partnership with Pure Water for the World. As Pure Water’s Trojes-based program supervisor, I visited Anatolia as part of my monitoring and evaluation visits earlier this summer. “I can’t believe I was drinking contaminated water for so long,” says Anatolia Nolaco, as she gently rests a calloused hand on the HydrAid biosand filter in her kitchen. Her long dark hair has just a hint of grey, barely giving away her age. But the lines on her face convey wisdom earned from a long, sometimes difficult life. “I never drink contaminated water anymore,” she says. Whenever she goes out, she brings a bottle of filtered water with her; in three years she says she hasn’t had a cup of contaminated water. “That’s the way it will be, forever and always,” she says. “I tell my husband, if we should ever move again, then this baby is coming with us, even if I have to carry it myself,” she adds with a laugh as she raps her arthritic knuckles on the filter lid. Originally from Danli, a neighboring municipality, she says her family members there also have a biosand filter that didn’t come from Pure Water, and they did not receive the household training that is part of Pure Water’s program. “I have educated them myself,” she says with pride. When she went to visit her extended family, she brought the instructional poster she received from Pure Water with her to show her family how to effectively use and maintain their filter. “I told them that touching the sand on a regular basis is bad, and this step should only be carried out when necessary,” she explains. “If you ever need a job, you can start as a health promoter for Pure Water,” I tell her, continuing my monitoring visit. I notice that the spigot of her filter is starting to break, and I offer to sell her a replacement. I tell her 25 lempiras, about $1.10. “Maybe next time,” she says. For many Trojes residents, the harvest has not been good this year; families are struggling. I give her a spigot anyway, and she smiles – the creases around her eyes deepen, reminding me of the life she must have lived. She thanks me, and adds that now that it is fixed, there is no excuse for her family members to use the filter incorrectly. I continue my visit, and after having a cup of gloriously sweet coffee with Anatolia, I head out to the next home. WASH Success Stories Beneficiary Stories, Honduras, Success Stories, WASH, WASH Success Stories, water. permalink. It’s the International Day of Charity: Why do you give?